Avro Lancaster Mk. I "Dam Buster"
One of the most famous and exciting events of the Second World War was the spectacular attack on Germany's Moehne, Eder and Sorpe dams by the R.A.F. The destruction of these vital power sources, deep in the Ruhr Valley, effectively disrupted German heavy industry for the remainder of the war. The historic attack was carried out by R.A.F. No. 617 Squadron flying specially modified Avro Lancaster Mk. 1 bombers. Each plane carried a radical new underwater bomb. The crews for this daring raid were trained in great secrecy by Wing Commander Guy Gibson. The pilots learned to fly their Lancaster's at night at the very dangerous altitude of 60 feet, swerving to avoid obstacles. The unusual design of the bomb required that it be released at exactly this altitude. To accurately achieve this altitude a unique arrangement of lights was used. Two spotlights were mounted so their beams would converge at exactly 60 feet. When the beams formed a figure 8 on the water's surface the plane was at the proper release altitude. The bomb casing was shaped like a tin can and tracks on the ends would permit it to be rotated at 500 rpm, by a belt drive, just prior to release. This rotation, reverse to flight direction, would cause it to skip across the surface of the lake behind the dam, passing over defensive torpedo nets and roll down the back face of the dam. A pressure activated fuse would detonate the 6,600 lbs. of explosive RDX 30 feet below the water's surface. The shock of the blast, contained by the water, would be directed against the concrete face of the dam. The force would be great enough to crack the dam and thousands of tons of water would do the rest. On the night of May 16, 1943, nineteen Lancasters took off on their historic flight. Wing Commander Gibson led his group to the Moehne dam and began his attack. One by one, the huge planes dropped down to 60 feet and released the deadly cylinders. When the third bomb hit, the dam collapsed and millions of gallons of water poured through the gap. Similar fate was met by the Eder dam, but only one plane succeeded in reaching the Sorpe and the single bomb was not enough to completely destroy it. Only twelve airplanes made the return trip, two having turned back before the attacks, but Germany's Ruhr Valley was a shamble. Mines were flooded, electric power disrupted and factories were destroyed and German war effort suffered a major setback. 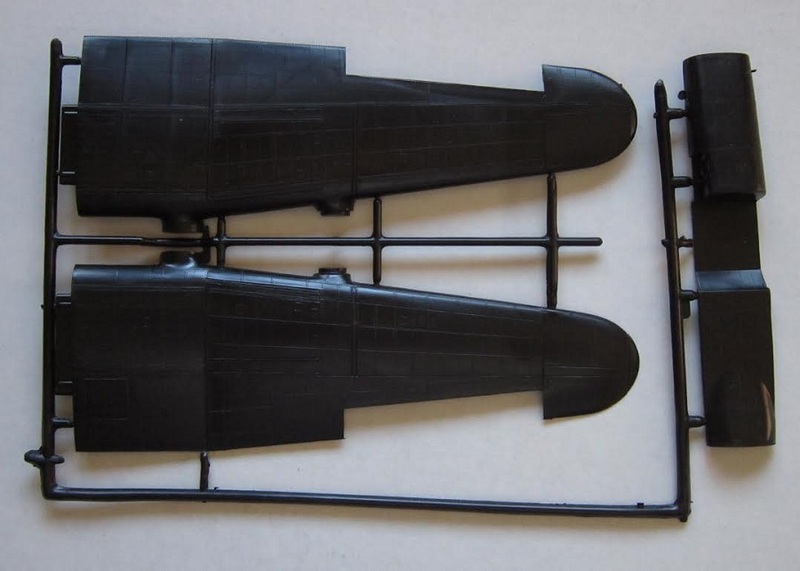 Revell's model of the Dam Buster is an accurate replica of Guy Gibson's plane "G for George". The Lancaster, considered to be the most outstanding British bomber of the Second World War, had a wingspan of 102 feet, a length of 69 feet 6 inches and stood 20 feet high. It was powered by four 1,640 hp Rolls Royce Merlin engines. Maximum speed was 287 mph. Service ceiling was 24,500 feet. Normal armament consisted of eight 0.303 machine guns located in three turrets: nose, dorsal and tail, although the Dam Busters had their dorsal turrets removed. Revell is an old prolific model company with facilities in the U.S. and Germany. Lately, they have been affiliated with Monogram. 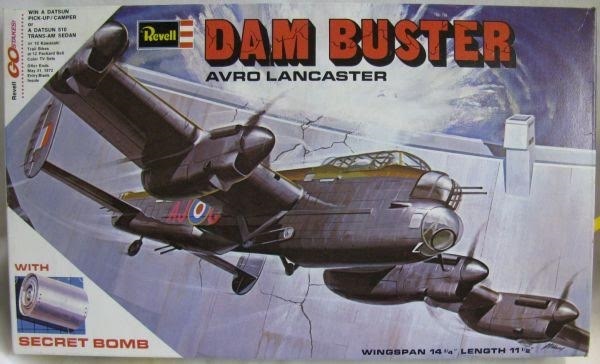 The box art shows a Lancaster attacking the dam. It is overall jet black with the red fuselage code of AJ (roundel) G. Guy Gibson's plane. One corner of the box art has an illustration of the cylindrical secret bomb. Another corner of the box art gives the model's wingspan as 14 1/4" and it's length as 11 1/2". 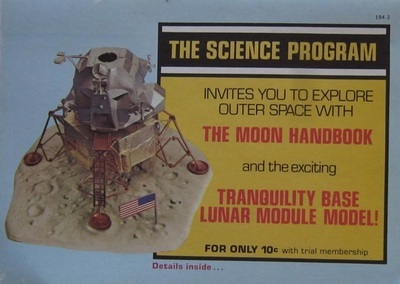 One side panel of the box has a color photo of the model made up, a copyright date of 1971, Revell's location in Venice, CA and MADE IN THE USA. 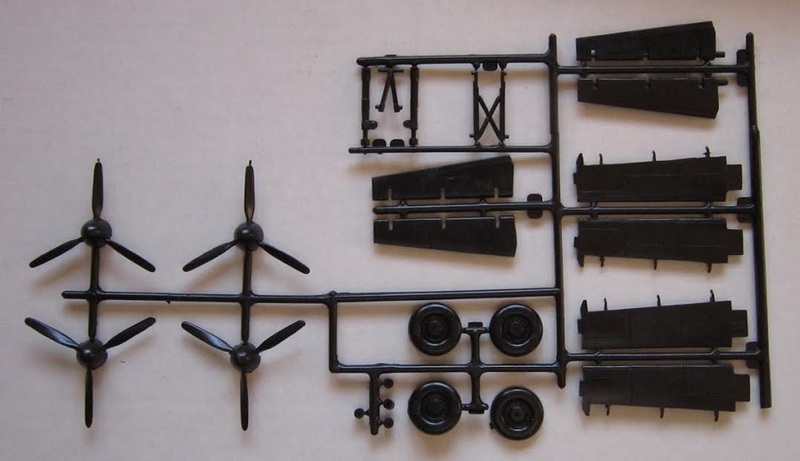 This is followed by a one paragraph history of the Lancaster and a list of the features of the kit: 1/72 scale, wingspan 14 1/4", length 11 1/2", retractable landing gear, movable control surfaces, wheels and propellers rotate, clear cockpits and gun turrets, secret bomb, four crew figures, official R.A.F. markings, accurate replica of Wing Commander Guy Gibson's plane "G for George". 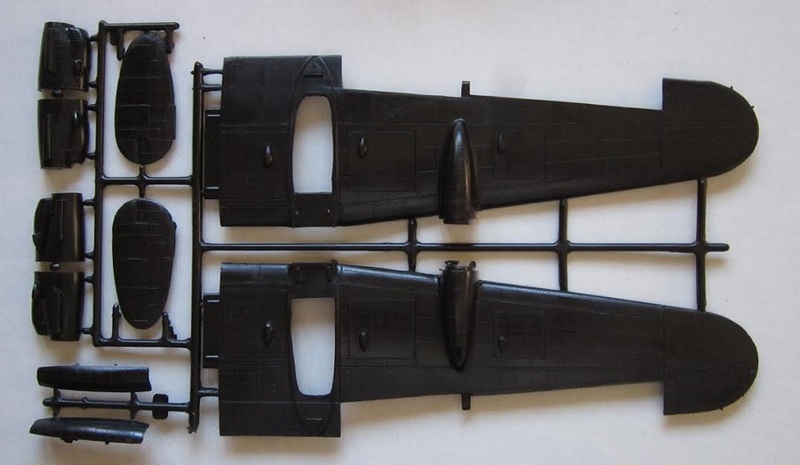 The other side panel has an application blank to join the Revell Master Modelers Club for a buck. 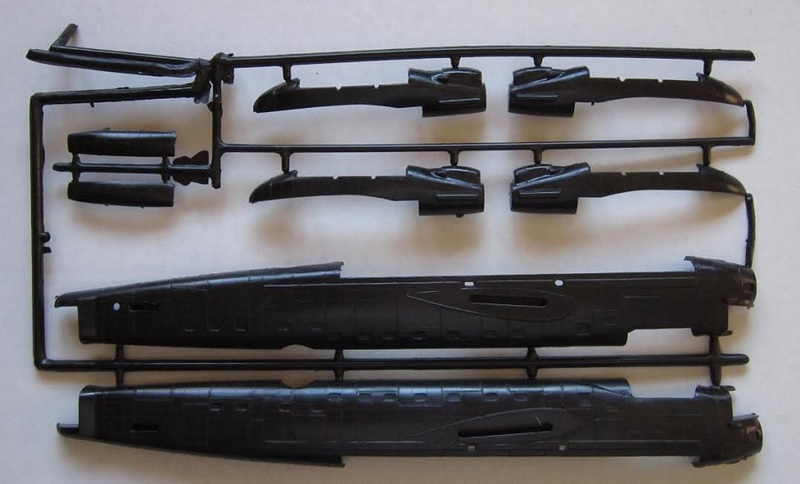 This kit contains 5 jet-black trees. Two of these trees are co-joined and bent over at the joint against each other. I cut these apart. 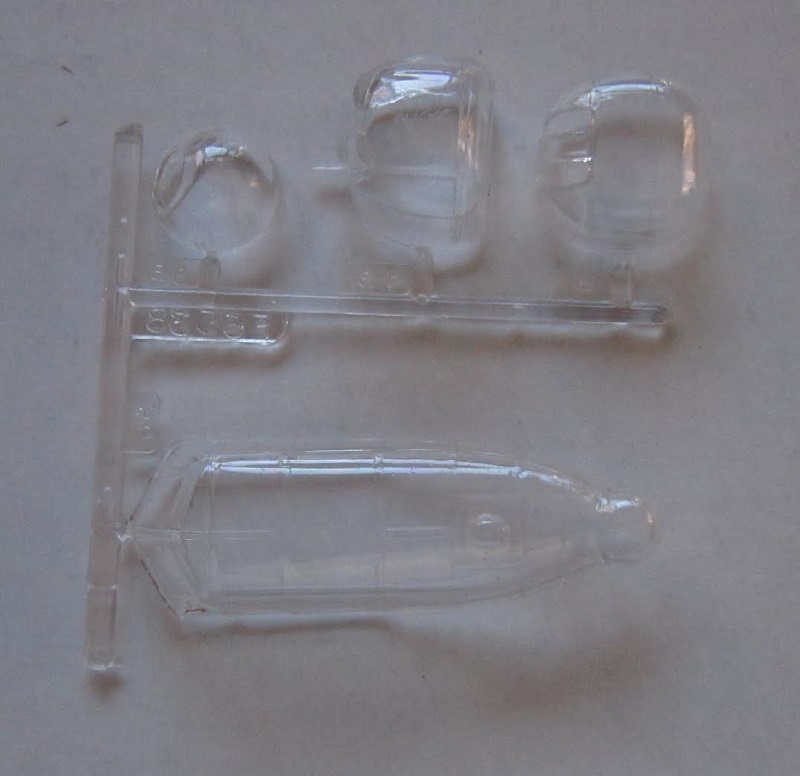 The clear tree, decal sheet and instructions complete the kit's contents. Trees are not cello bagged. They also are not alphabetized or illustrated in the instructions. Only the smaller parts have number tabs next to them on the trees. Bad move Revell. The instructions consist of a single sheet printed on both sides in 17" x 10 3/4" page format, folded twice to fit the box. The face side of the instructions has 3 assembly steps with lots of text to walk modelers through the builds. The other side of the instructions has the 4th and final assembly step over the history of the Lancaster and a 3-view of the box art subject. ​The 1st jet-black parts tree holds: lower wing halves, cowling halves, rudders, landing gear compartment doors (10 parts) This tree and the next one are the co-joined ones. 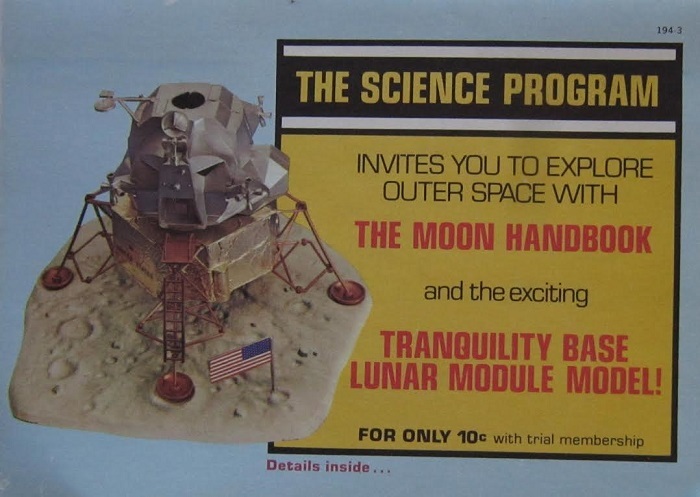 The decal sheet and SCIENCE PROGRAM registration form complete the kit's contents. There is little or no interior detail. Panel lines are of the raised variety. ​This is a neat British subject. I really enjoyed the movie about the raid on the dams years ago.